A grief-stricken mother reluctantly prepares for her son to marry, but trouble waits outside the bride’s house – and he’s on a motorcycle. George Richmond-Scott’s update of Federico Garcia Lorca’s Blood Wedding features a union between two restaurant-owning Spanish immigrant families in London. The way in which the play has been condensed from three acts to two makes for a production of uneven halves with insufficient room to include the stranger elements of the original. There’s little space for a sense of attraction or loss to develop between these characters. The naturalistic tone used by most of the actors doesn’t mesh well with the higher register of some of the language or with the intensity of the character of Mother, played arrestingly by Maria de Lima. 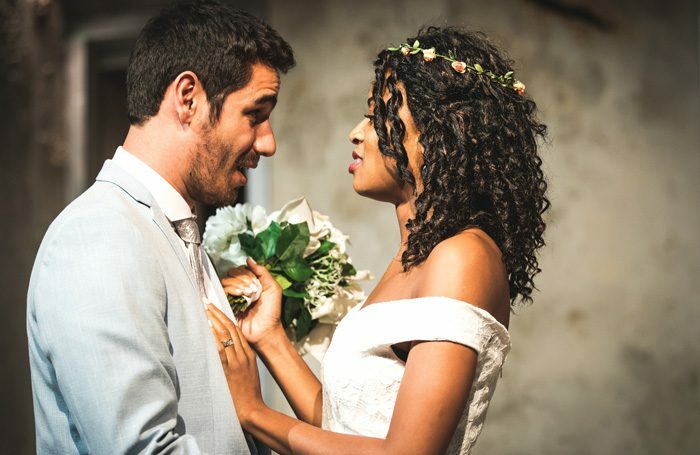 Racheal Ofori gives a sympathetic performance as the torn Bride, while Yorgos Karamalegos’ Moon is a confusing but alluring presencee. While Richmond-Scott’s production makes inventive use of the space at the Omnibus – don’t be caught outside during the interval – the set is a bit disappointing. A few large, gold-lipped cracks mark the grimy walls and four doorways allow synchronised exits and entrances, but it’s too anonymous to be distinctive. Christianna Mason’s costume design is bold though, with de Lima in particular standing out in her death-as-baglady costume. She also gets to wear the most dramatic of mourning gowns. Camilla Mathias’ music is also a welcome addition, but the production as a whole suffers from tonal inconsistency and being delivered at breakneck speed.